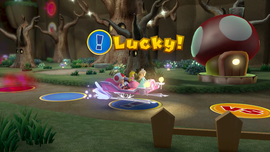 Haunted Trail is one of the five boards in Mario Party 10. 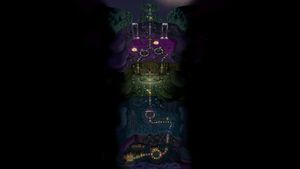 The board is set in a haunted forest, similar to the sub-section of Soda Jungle from New Super Mario Bros. U, with a small town at the start of the board, and also passes through a graveyard and over a poisonous swamp. Many Boos and Swoops can also be seen around the board. The mini boss for this board is a Mega Sledge Bro, with King Boo as the boss fought at the end of the board. Along with Airship Central, it is the only board that cannot be played on in Bowser Party mode. This board also has a unique gimmick, where a Boo will haunt the captain when a certain area on the board is passed, and will lick them every turn, stealing five Mini Stars. The board has three of these spots, however two of them are on separate routes, so only two Boos can haunt the vehicle during the game. The Boo can be passed onto another player if they land on a Boo Space, or can be scared away by passing under a Streetlight. The playable characters on a Lucky Space. Haunted Trail begins in the center of a small town, before heading past some Mini Stars to the first fork in the road. Both routes are equal length, however the left has five Mini Stars and the right has eight. The path then turns left and goes up a wall, to the first Boo spot where the path levels out, then takes another left turn to a Toad House. The trail continues through the graveyard to a right turn and another fork in the road. Here, the left path has eight Mini Stars, while the right has three Mini Ztars. The path continues up another wall to the first streetlight and the mid boss fort. After the fort, the path splits again, with the left route leading almost immediately to another Boo. This route then goes up another wall to another fork, with eight Mini Stars to the left and five Mini Ztars to the right. These two paths then re-join, and meet up with the right path again. The right path is one space longer than the left and has a different arrangement of spaces, but is otherwise the same, except for the Boo being positioned later on the path and the Mini Stars and Ztars switching sides. Immediately after the paths meet, the players reach the Homestretch, and travel up another wall to another streetlight, onto the final road to the castle where the main boss is fought. This page was last edited on December 11, 2018, at 01:05.